SPACE STATION NATHAN: Launch Day! 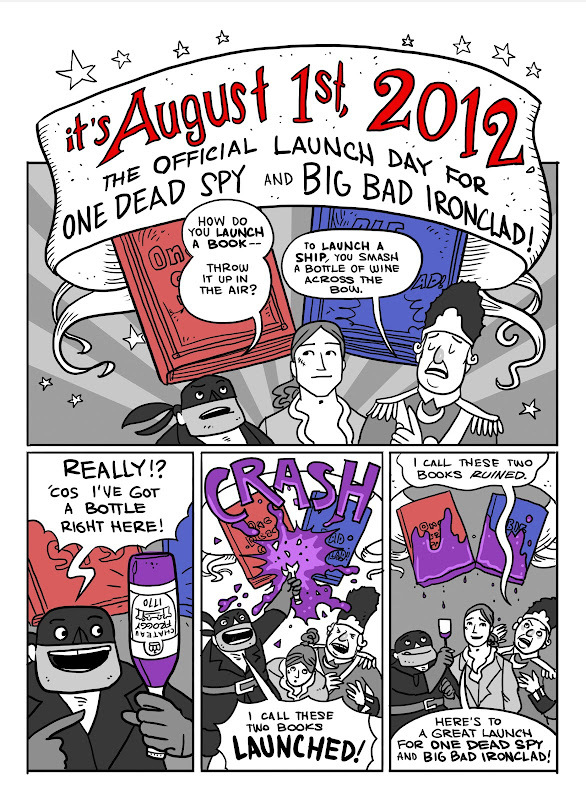 It's officially launch day for my two graphic novels, One Dead Spy and Big Bad Ironclad! These books are now available wherever books are sold! Who are these three characters? They are the narrators of the Hazardous Tales series. We'll be finding out more about them in the coming days. Now where has that pesky Frankenstein gone? All the readers in our house have read both of the HHT at least once! We LOVE Them! Even being a Navy spouse, naval history seems really boring to me. But I loved Big Bad Ironclad! Really fascinating stuff! I loved hearing about the birth of the Rangers and the Navy Seals. Truth is more exciting than fiction. There are things that look almost like Frankie in your blog background. Congratulations on your launch. I have read both books and show them with anyone who comes to my house. My daughter and I both want to learn more about Henry Knox and William Cushing. I think that is a sign of a good book, you want to read more about the subject. I want to see Frankenstein in Taco Hell. Then you can finish two stories at once. Thanks so much everyone! Thanks for sticking with the blog through this off-and-on year, and thanks for being the ones who buy the books! FOUND HIM! I was WAITING for him to be on the header.